Beginners in art often find that painting with acrylics is an easy way to get started. This book takes an innovative approach to instruction in acrylic illustration, presenting step-by-step explanations of successive details for beginning students to accomplish in a series of paintings-in-progress. Dual-purpose book covers can be set up to create a miniature easel. Each project for the artist to complete appears as a series of two-page sections with an illustrated explanation of how to proceed on each even-numbered page, and a large illustration of the painting-in-progress on the following odd-numbered page. Beginners paint only what they see in the unfinished illustration. 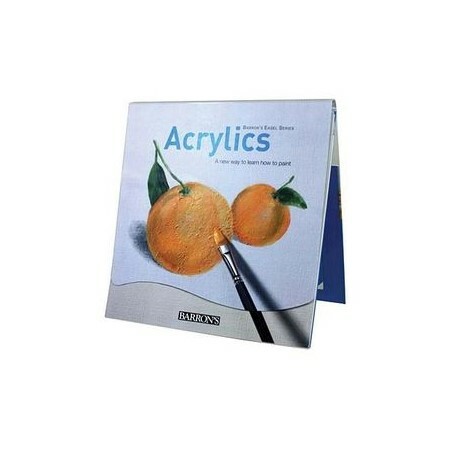 The easel format encourages them to stand the book up and let the progressive illustrations for each project serve as their step-by-step tutorial. With every flip of a page, they'll see the painting they are copying in progressive stages of completion. All they need to do is to take up their brushes and start working. This book presents seven separate projects for students to complete.